When you work from home, staying productive can sometimes be a challenge. Well, I take that back, when you work ANYWHERE, productivity can be a struggle. For most solopreneurs this is simply solved by having a system in place, something that tells you when to push forward and when to take a break. However, finding the system that works for you can be tricky. I was notorious for sitting down in the morning and creating a to-do list for the day that was just way too long. Then I would spend all day long jumping from project to another. My biggest downfall was that I loved to work so I would keep going well past the designated stop times. So I implemented a couple project management techniques and now my day and business run smoothly. The hardest part, in particular, was knowing when to follow an idea and when to simply put it on a list for later. 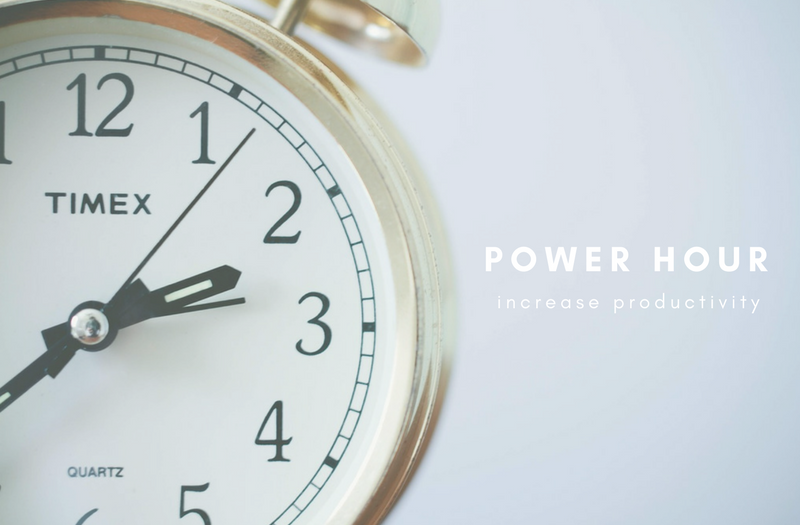 My absolute favorite method for increasing productivity is the idea of the Power Hour. Haven’t heard of this method? It’s super easy (and highly productive!) to introduce. Declare you are taking a Power Hour. Post it on Facebook, text it, whatever you need to do to let people know you are not available for the next hour. Get a crazy amount of work done! For one hour you are a powerhouse of productivity. You don’t stop to get a snack, you don’t stop to answer the phone, and you certainly don’t answer any emails! If anything pops up during your Power Hour that requires contacting someone, simply write it down and complete it when the hour is over. INSIDER TIP: Use an alarm that isn’t on your phone to time your Power Hour. This helps to decrease that twitch to pick up your phone and check the timer. Once that phone is in your hand, we all know you’re going to be tempted to check emails or social media. Once the hour is over, go back and address anything that came in during that time. This is when you take a break, get that snack, use the bathroom, make a call, etc. When you’ve addressed everything and are ready to be productive again, take another Power Hour! Try it out, then let us know how it worked for you!